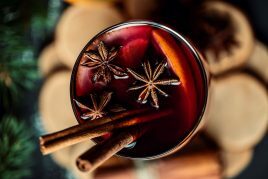 Nothing says festive like the aromatic warmth of mulled wine, and this unctuous syrup packs a delicious punch. Use it straight away to please a crowd, or stop before adding the remaining wine and keep the syrup on hand for a mulled wine emergency. Put the sugar in a large saucepan. Add the citrus peel and squeeze in the clementine and orange juice. Add the cloves, cinnamon stick, bay leaves, ginger and about 10 to 12 gratings of nutmeg. Then stir in just enough red wine to cover the sugar. Put the pan on a medium heat and let the mixture simmer until the sugar has completely dissolved into the red wine, then bring to the boil. When your syrup is ready, turn the heat down low and add the star anise and the remaining wine. Gently heat the wine and after around 5 minutes, when it’s warm and delicious, ladle it into heatproof glasses and serve.